Snazaroo's best-selling basic kit is ideal for beginners and for general use. The Unisex Palette includes 2 ml pans of White, Black, Bright Red, Sky Blue, Bright Yellow, Grass Green, Purple, and Bright Pink. 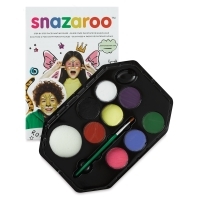 It also includes a brush, a sponge, and a 16-page, full-color face painting guide. Paints 50 full faces.